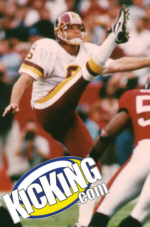 Background: Creator of Kicking.com, Doug was an All-American at California and is currently with the New York Jets after stops in San Francisco and New Orleans, with recent performances in 2002 with the Minnesota Vikings and 2001 with Indianapolis and Tampa Bay. Background: Tommy was an All-American two years at North Carolina, then went on to a successful NFL career, playing for Tampa Bay, New Orleans, Carolina and Washington. 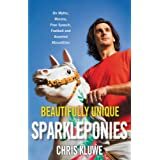 Background: Creator of "Kickers and Punters Only" site, Brion kicked and punted at the University of Iowa. He played two seasons in the Arena Football 2 league for the league champion Quad City Steamwheelers. 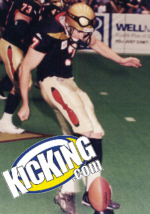 He spent two pre-seasons with the New York Giants (kicker 1997, punter 1999), as well as one season with the now-defunct Iowa Barnstormers in the Arena Football League. 1995 and 1996. In 1996, Aaron set an Arena Football League record by making a 63-yard field goal, which would tie the NFL record. 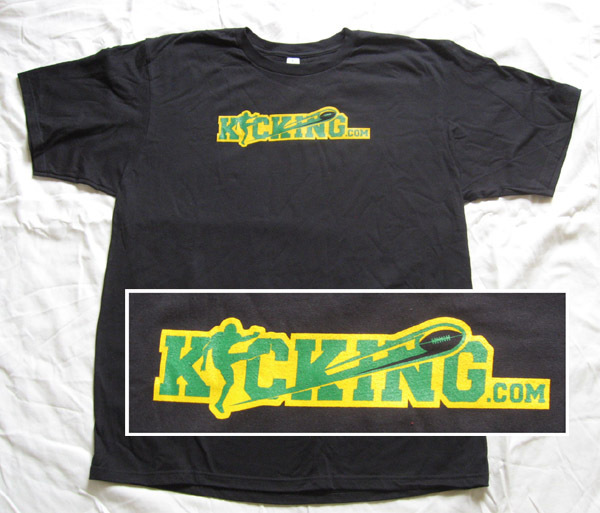 I know [he] appreciates what kicking.com has done for him over the last few years and we do too! Getting the exposure in the kicking combine series was excellent! Thanks again!